A warm, wonderful low-fat alternative to chili. Preparation Time: 15 min; Cook Time: 20 min. In a large saucepan, stir together oil, onion and garlic over medium heat until onion is softened, about 5 minutes. Add 1 can of beans and mash into onion mixture with a potato masher or a slotted spoon (mixture will be chunky). Stir in second can of beans, green chilies, corn, carrot, celery, chicken broth, cumin, chili powder and salt, if desired; bring mixture to a simmer. 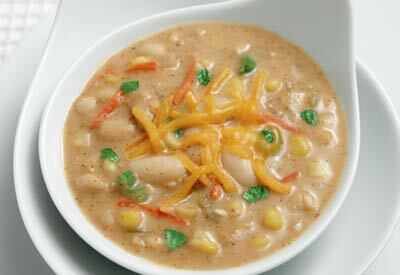 Blend cornstarch into milk and stir into chowder; bring slowly to a boil, stirring frequently. Reduce heat and simmer 5 minutes, or until corn and celery are tender and mixture thickens. Stir in 1 cup of the cheese just until melted. Serve in individual bowls and top with fresh chopped cilantro, if desired.